This is the perfect companion to our Round Pen and Ground Work videos, as well as a handy guide you can print, view on your computer, or access on a tablet and take with you out in the training pen! You can also use it as a stand-alone training manual for home practice and study. We’ve found that many new students report going home after a clinic feeling very positive, and the next day they can’t remember how to do some of the things. It takes time and repetition to master the use of one’s hands and body positioning to communicate effectively with horses and mules. 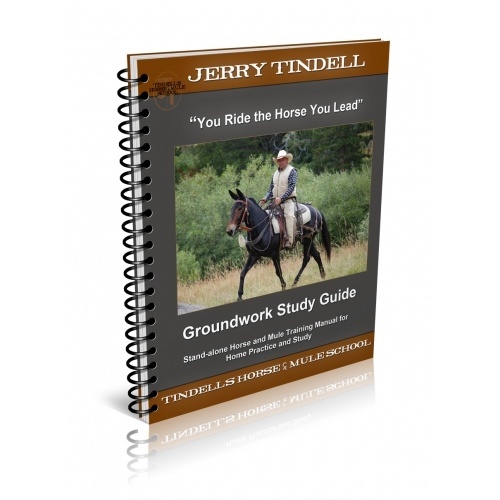 This guide addresses those issues with detailed, step-by-step photos and instructions for every aspect of ground work training. Our thanks to Kathy O’Meara and Karena Quigley for their tremendous work in creating this Study Guide! 40 Pages with Full Color Illustrations. Full Training Manual in full color *plus shipping and handling.